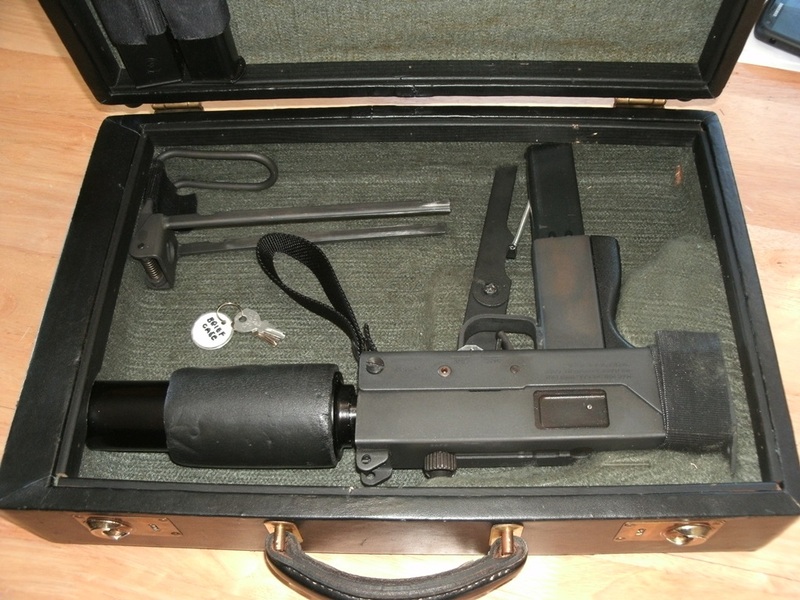 VERY VERY RARE...OPERATIONAL BRIEFCASE W/MAC 10 9mm SMG AND CUSTOM RPB BRIEFCASE AND CUSTOM RPB SUPPRESSOR. THIS IS OLD COLD WAR STUFF. This RPB/MILATARY ARMS CORP MAC 10,9mm SMG 9 (ON FORM 4) was sold as a package 30 years ago to a collector when Franklin Arsenal sold all their inventory. The gun itself is in like new condition, and it looks like it was test fired only. This has the briefcase shorter suppressor(ONLY 11 MADE) and the standard longer version can with it also. The cans are both the originals and in very good condition.It starts with a Mac 10, 9mm SMG from Military Arms Corp that RPB finished off, and the Briefcase Suppressor is also RPB. (ALL ON FORM 4'S IN FL.) The Suppressor paper work (form 4) spells out the Suppressor serial and the Briefcase itself. Then, the Briefcase has no visible serial number, and had not had the trigger set up in it till I got it. So I set it all up and ran the thing ,and it's flawless! Coolest thing I have ever seen. I took a bunch of detailed pics to show.